the first “book” i ever wrote was one i bound myself, in the publishing center at ryan road elementary school. it was called “the cat and the dog go to the farm” – and i’m pretty sure it consisted of little more than, “the cat and the dog went to the farm. they had a great time. they went home.” but somehow, in selecting the front and back of my book from stacks of patterned pieces, in “binding” together the pages with colorful tape, i knew that i’d found something important. something that could help me sort through the voices in my head. when i first lost my job last spring, i was devastated. the voices in my head were louder than ever. “you’ve failed,” they said. “you’ll never work again,” they said. “you were never worthy to begin with,” they said. and for a few weeks, i listened. i wallowed, i cried to my overly understanding friends and family, and i wondered aloud whether i was wrong – whether i wasn’t meant to work with words, whether writing wasn’t my calling. i worried i’d overestimated my skills, that i wasn’t good at what i did, not a little bit, not at all. i thought about what it would take to open a bakery. i started this here “food blog” (though it’s changed since inception), thinking that maybe it would help me sort out my thoughts. i considered going back to school, taking a few interior design courses. i contemplated moving back home. and then, something magical happened. a recruiter called, and said someone wanted to hire me, and how soon could i start? and no, they didn’t want to interview me, they’d seen my book, and that was enough. which meant, of course, they’d seen my writing. they’d seen how my brain worked. and they liked it enough to offer me work on the spot. three days later, i walked into an ad agency on the famed madison avenue, and i didn’t walk out until four months later, when i had a full time job offer at another agency in hand. if this were a movie, this is the scene where i’d say, “see, haters? i told you you’d rue the day you told me i couldn’t do it!” but the truth is, the only haters around were the ones in my own head. everyone but me believed i’d work again, knew that the job i’d get next would make me stronger, smarter, happier. i was the one who wasn’t so sure. the quote above really makes you stop and think about what you spend your days doing. because it’s true, isn’t it? 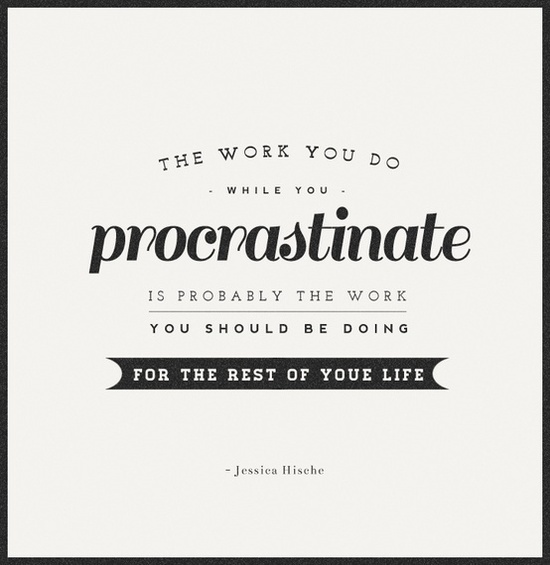 what you do when you procrastinate is what you love to do. what you do when you’re sitting on your bed in flannel pants and an oversized sweater with pimples on your forehead and not a stitch of makeup (what? you don’t have pimples on your forehead right now? that’s just me?) – that’s what you love to do. and me? i love to write. i have my days where i doubt myself, where the voices tell me i’m not talented, i don’t have what it takes, i’m doomed – and then i remember that i’ve been doing this since i was old enough to dictate stories to my parents. i’ve been doing it long before i could write, long before i could type, long before i knew i could be paid to write the ads that appear on my TV. recently, i was asked to contribute a story to bar method’s facebook page. contributors were told to talk about where they were when they started taking classes at the studio, what obstacles they’ve had to overcome since, and what they feel it means to them. i submitted my piece last week, and this weekend, i gave it to my mother to read. and in the middle of a crowded saturday brunch in the west village, as she scrolled through my phone, her eyes began to water. and when she looked up, there were a few salty tears dripping down from underneath her glasses. and you know what she said? and while she’s my mother and the big man upstairs probably paid her to say that, sometimes, just sometimes, i think she might be right. and man, do i feel thankful that i get to do something i love, and (bonus!) i even get paid for it. lucky, lucky me. i still hear voices in my head. but for the most part, they’re good voices. they’re the voices i hear when i walk by the most spectacular townhouse on west 10th street and see a mom ladling giant pancakes onto her son’s plate through an oversized window. they’re the characters i imagine as i sit next to a young couple in love on the subway. they’re the stories i hear when i plug in my headphones at work and open a new word document, my fingers flying across the keys. and if the voices ever get to be too much? well, then you can lock me up. but until then, i think i’m satisfied telling stories, putting moments and memories down on paper (or electronic paper, i suppose), and doing the one thing i’m pretty damn sure i really, truly love.